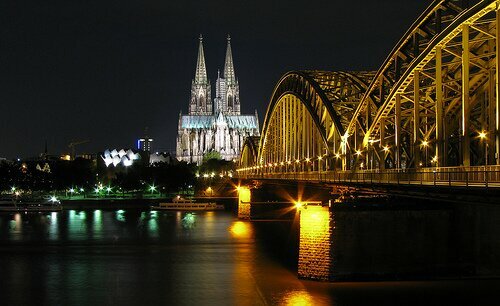 The Cologne Lights, Kölner Lichter, is a spectacular event which takes place every year in Cologne along river Rhine. For the entire evening, dozens of illuminated boats cross the river while the buildings shine in many colors and thousands of fireworks burst in the sky. Five tons of fireworks will delight an audience of nearly one million people. Who has the good fortune to be in Cologne on the evening of July 19, may enjoy a truly magical evening: the city lit by thousands of small and major sources of colored lights reflected by the waters of river Rhine. As soon as the evening starts, you will see dozens of small and large boats decorated with lights slowly sailing the waters of the river, while multi-colored artificial lights illuminate the buildings and monuments in the historical centre. Also citizens make their contribution to the party, setting lights and lanterns everywhere, on balconies and windowsills, as well as in the streets and squares. But the most special moments of the Kölner Lichter are the fireworks shows, scheduled at different times of the evening: when the boats set sail, at their arrival at the two hubs of the festival, the Tanzbrunnen and Rheinpark areas – both overlooking the river – and for the grand final. For this year’s edition things have been done in a big way. Nearly one million visitors are expected, who will enjoy a wide range of services, but mostly, hundreds of thousands of stars will be distributed, to be lit simultaneously at 23.30. More than forty technicians will set off the fireworks for the show, many of whom will be shoot in sync with music. More than 5 tons of fireworks will light up the night of Cologne Lights. This entry was posted in Events and tagged Cologne..